One aspect of "advertised cost sharing" flights that ought to be examined in detail by the pilot's participating in such activities is the insurance coverage. I know Wingly carry some insurance, however I know of at least one aircraft where the hull insurance is invalidated in the small print of the policy (not on the certificate) if the flight has been advertised. I am told by a friend who works in aircraft insurance that such clauses are now common in many policies. Miscellaneous wrote: Are you one of the selective post readers? T67M wrote: One aspect of "advertised cost sharing" flights that ought to be examined in detail by the pilot's participating in such activities is the insurance coverage. I know Wingly carry some insurance, however I know of at least one aircraft where the hull insurance is invalidated in the small print of the policy (not on the certificate) if the flight has been advertised. I am told by a friend who works in aircraft insurance that such clauses are now common in many policies. Now I wonder why they do that. But as we all know, what it says on the tin and what happens in reality can be two different things altogether. In aviation its always been the case of, as long as the paperwork = the weight of the aeroplane nobody asks questions until something goes wrong, its all about covering your rrse. Lockhaven wrote: Now I wonder why they do that. And who can blame them? I still think we’ll see an accident/incident involving a flight booked via one of these sites. I am sure we will, as sure as eggs is eggs. But whether the accident has any bearing on the method of booking is less certain. I don’t think the method of booking has anything to do with it. I do think that the pressures imposed, by either side and however subtly, does. These apps/sites are being abused by some, perhaps a minority, and that is going to cause a problem. So I have two examples of flights advertised on Wingly where someone questions the costing. No one has realised that wingly add on 15% that doesn’t go to the pilot. The advertised price to the passenger includes the 15% commission that goes to wingly. So the cost sharing works out once you realise that. I.E. Wingly split it, then add 15% on to the price the passenger pays. Why doesn't Wingly need an AOC? For the same reason that a notice board in a flying club doesn't need an AOC. @defcribed, you'll have to explain that to me please. I don't see any commonality between a flying club noticeboard used for/by members and an independent company whose only objective is to profit from what is essentially selling flights, even if the costs are equally shared. @Miscellaneous, they're not selling flights - they're putting people with compatible requirements in touch with each other and taking a commission on that process. This is a common enough business model and is not aviation-specific. You may feel that this is not an appropriate state of affairs and that they ought to be viewed by the appropriate authorities as selling flights and either regulated as such or prohibited from trading. You're entitled to that view. At the moment though, what you would like to be the case is not the case. The CAA have even gone as far as to say they have no problem with this particular company. The rules allow a PPL to cost share. The rules allow a PPL to carry passengers and give them the discretion to choose for themselves who those passengers might be. I don't believe either of those rules should change. Is there any evidence to suggest that PPLs are making poor go/no-go decisions because of newly-found pressures resulting from flying with relative strangers, or that they are planning and flying trips beyond their abilities? Have there been any accidents or incidents? Whenever anyone posts a link to an advertised flight with the clear implication that they think it's a bad idea, I always wonder what in particular they're objecting to. The cost is usually quickly established as reasonable enough with reference to typical aircraft hire rates. So then I wonder if it's the trip itself.... are they saying a <100hr PPL (or whatever) should not attempt to fly to Jersey (or wherever)? I certainly crossed the channel with well under 100hrs, several times. The forumite posting the link almost certainly does not know the pilot concerned, so what position are they in to comment on whether someone should make a particular trip or not? Even before the Wingly debate emerged I always felt there was a significant feeling among the more established pilot population that new PPLs should serve a significant apprenticeship flying club PA28s on <1hr burger runs to well-known airfields and rack up a few hundred hours of this before attempting anything more interesting. As soon as I had 45hrs and a licence I bought a share (TB10), did the IMCr and started venturing further afield including across the channel. My choices did attract comment from instructors and established PPLs at my home base, and I feel that part of the sentiment in this debate is much the same thing. I've never used Wingly and have no plans to. N264DB is irrelevant to the Wingly debate. defcribed wrote: @Miscellaneous, they're not selling flights - they're putting people with compatible requirements in touch with each other and taking a commission on that process. I'd argue Wingly selling gift vouchers clearly falls within the definition of selling flights. Wouldn't you? How does that differ from a travel agent selling a flight? Even so, the analogy of the club notice board is way off the mark. defcribed wrote: You may feel that this is not an appropriate state of affairs and that they ought to be viewed by the appropriate authorities as selling flights and either regulated as such or prohibited from trading. You're entitled to that view. Absolutely, I don't feel strongly enough to take any action to try and change matters. I am merely engaging in the conversation re pros and cons. defcribed wrote: Is there any evidence to suggest that PPLs are making poor go/no-go decisions because of newly-found pressures resulting from flying with relative strangers, or that they are planning and flying trips beyond their abilities? Have there been any accidents or incidents? I have no idea, I'm not of the opinion that rules should only be changed post a disaster. I thought safety rules were there to prevent accidents? defcribed wrote: So then I wonder if it's the trip itself.... are they saying a <100hr PPL (or whatever) should not attempt to fly to Jersey (or wherever)? I certainly crossed the channel with well under 100hrs, several times. The forumite posting the link almost certainly does not know the pilot concerned, so what position are they in to comment on whether someone should make a particular trip or not? Tell me, why do you think a flying school could not operate pleasure flights without an AOC, even with instructors flying them? defcribed wrote: N264DB is irrelevant to the Wingly debate. Agreed, wouldn't dream of suggesting it is relevant. It is an example, however, of what can go wrong even when there are rules in place. Pete L wrote: Why doesn't Wingly need an AOC? Because the flights are not commercial air transport. 1. Operators shall only operate an aeroplane, a helicopter or a sailplane for the purpose of commercial air transport (hereinafter ‘CAT’) operations in accordance with the requirements specified in Annexes III and IV. (a) Without prejudice to Regulation (EC) No 1008/2008 of the European Parliament and the Council, prior to commencing commercial air transport operations, the operator shall apply for and obtain an air operator certificate (AOC) issued by the competent authority. Miscellaneous wrote: I'd argue Wingly selling gift vouchers clearly falls within the definition of selling flights. Wouldn't you? How does that differ from a travel agent selling a flight? No, I wouldn't have said so. A travel agent purchases a flight and then resells it with a markup. A voucher is just a means of bringing revenue forward and the voucher does not in itself represent a contract for a particular flight - it's just credit to spend via their platform. Miscellaneous wrote: Even so, the analogy of the club notice board is way off the mark. I really don't think it is. The obvious difference is that one is a business and the other is not, but neither is actively involved in anything to do with actual flying. It just puts people in touch. Miscellaneous wrote: Absolutely, I don't feel strongly enough to take any action to try and change matters. I am merely engaging in the conversation re pros and cons. And a stimulating discussion it is! I feel strongly that there should be no change because frankly I'm not keen on any change that allows us to do less. 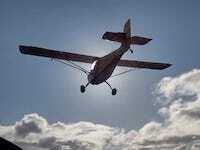 A PPL has been issued with a licence and can either be trusted to choose when/where/what/who they fly or they cannot. If they cannot then they should not have been given a licence. Reductio ad absurdum, why not place all PPLs under full-time ATO oversight and make every single flight subject to the sign-off of an instructor? The trend towards ever-increasing restriction is already there, and I fully accept that by the time I'm of retirement age (I'm 37 now) then light GA flight as we know it today is likely to be pretty much impossible - regulated and priced out of existence. I accept that and just want to enjoy it for as long as I can. Miscellaneous wrote: I have no idea, I'm not of the opinion that rules should only be changed post a disaster. I thought safety rules were there to prevent accidents? Unfortunately most safety innovation comes from hard-won experience rather than theorising. Almost everything is based on an accident or incident, often one that killed people. Miscellaneous wrote: Tell me, why do you think a flying school could not operate pleasure flights without an AOC, even with instructors flying them? Because they are a profit-making business engaged in the operation of aeroplanes and the public expects very high standards to be enforced. We could debate moral hazard for hours, but business always needs stricter controls than private activity because of the temptation to cut corners in pursuit of profit. Miscellaneous wrote: It is an example, however, of what can go wrong even when there are rules in place. The flight was evidently illegal (although lack of paperwork does not in itself down an aeroplane) but the solution to that is not to make more things illegal. Last edited by defcribed on Mon Feb 11, 2019 6:08 pm, edited 1 time in total.